Some embroidery in progress... The pattern is based on the Halberstatt wall-hangings (you can look up this wall-haning on www.bildindex.de. I made a new embroidery frame yesterday to use instead of the modern round embroidery frames. 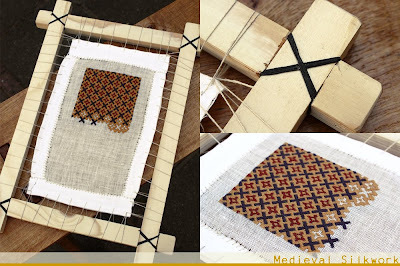 The frame is based on diverse medieval iconographic sources. I'll be off to an event in Azincourt (northern France) for the weekend in a couple of hours, so I need to log off and continue packing.